Whether your renovating or building a new home glass is an essential part of any domestic property. Glass windows play an important part in providing natural light and ventilation, whilst adding to the visual appeal of your premises. Besides windows, glass is used in a variety of situations throughout the home including mirrors, splashbacks, shower screens and more. The most important consideration when using glass in any property is that all installations comply with the current Australian Standards. 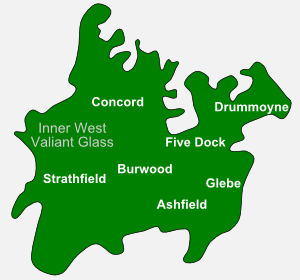 Valiant Glass provides glass and glazing services throughout the Inner West of Sydney, including surrounding areas such as Burwood, Strathfield, Ashfield, Five Dock, Concord, Glebe and Drummoyne. These services include the installation of new glass and the replacement of existing glass panels. Our staff are fully qualified glaziers which guarantees your glass is installed to the highest standard. Call your local Valiant office to find out more about our comprehensive range of glass products.